There are simply too many features to list. What can be said is that this is a truly unique experience. 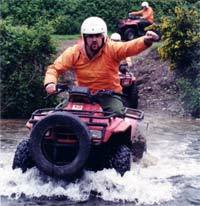 A fantastic,rugged,wild outdoor activity which is great fun for all the family. Naturally the groups of men that come down really get a great kick out of this. Its a great way to let off a bit of steam as it probably is for those working in office environments to get some quality relaxation from the stresses and strains of the corporate world. It may well be that you bump into some well known sporting personalities who regulary visit us, even from overseas. For us this is great testimony to the quality of our Safari. There's plenty of wildlife to see and the Castle gives an added element of the ancient to the rugged and beautiful surroundings. This is not just a cliche, it really is very different to what most of us are used to. You will be given a good quality Honda quad bike. No previous experience in necessary. Gradual increase in difficulty throughout the course. Kids over 8 are no problem. Intricate course, guaranteed not boring. All equipment is supplied. Wellies, helmet, waterproofs. Famous sporting personalities sometimes arrive.